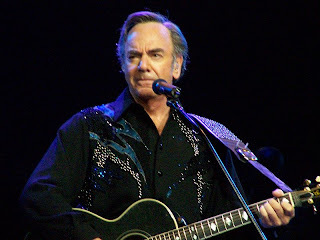 I had the very insane luck of getting my hands on a free ticket to Neil Diamond at MSG last week. The concert was splendid starting from Neil rising up to the stage looking like the love child of Dennis Kucinich and Johnny Cash to the two full out chorus sing along reprises of "Sweet Caroline", but the real fun for ME was before the show. "Get you Neil Diamond programs here!" "Getya Neil Diamond programs here-A!" "Naaaay Getya Neil Diamond programs here-A!" I listened closer and the mystery word or phrase keep being repeated. What could it be? "HERE Getya Neil Diamond programs here-A!"? "NEIL Getya Neil Diamond programs here-A!"? "HEY Getya Neil Diamond programs here-A!"? I became obsessed. When you listen to a word 30 times you begin to go insane that you can't understand what it is. At least I do. After a large whiskey. So I leaned over to the man and asked him what the first word he was saying was, you know, the word before Neil Diamond? He looked at me like I was a psychopath. "I'm saying: get your Neil Diamond programs here." He stated, a little insulted. No, no, I argued, the word you say BEFORE that whole thing. "Naaaaay Getya Beer, Soda, Cold water here-A!" Harry and I concluded that this little "naaay" was simply a brilliant way to get the attention of the concert going crowds. It was a nice little secret that all hawkers must know. No wonder the program guy didn't want to tell me. I wish I had been there for the "Naaay" testing out process. I bet they tried out "Ahhhh", "Gahhhh", "Graaaay", "Baaaaah", and "Awoooooogah!" befor proving that "Naaay" was the proper choice.